In 1994, Vincent Connare wasn’t expecting to become an international target for resentment. Stuck elbows deep in a project known as ‘Microsoft Bob’, he was tasked with helping Gates create his most user-friendly interface yet; the sort of package any redneck could use without a subsequent meltdown on the phone to technical support. There was, however, one minor problem: everything was written in Times New Roman, a harsh font Connare couldn’t see connecting with users. Rather than feel like a 19th century schoolmaster was chastising them, he reasoned that his hypothetical redneck would prefer something warmer; a friendly voice that could point him in the right direction, rather than simply hector. It just so happened that Connare kept a number of graphic novels in his office. Deciding he liked the speech bubble style employed in comics like Watchmen, he tried to emulate it. According to Connare, he was aiming for ‘letters that might have been created by cutting with blunt scissors’; something childish and homely. Ultimately his experiment was rejected for use within MS Bob, but when it came time to launch the mega-successful Microsoft Movie Maker, Comic Sans was chosen to be the program text. By the time Windows 95 came out, the font was selectable in Microsoft Word, and a minor revolution was born. For a certain subset of users, this was it; the moment they’d been waiting for. With the home computer market just beginning to boom, Comic Sans arrived at the exact right moment for Primary School Teachers, bored mums and Village Fete organisers to embrace it as a ‘fun’ kid- friendly alternative to the standard fonts. Unfortunately, it didn’t stop there. 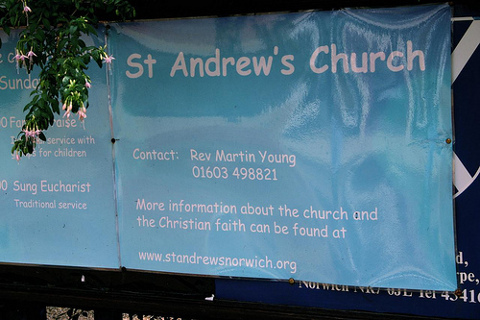 Like a particularly virulent bushfire, Comic Sans spread across the English-speaking world with an unstoppable fury. Business documents, warning signs, football shirts and even funeral parlours started using it; seemingly unable to see the discord in a childish scrawl advertising something serious. The utter ubiquity of Comic Sans in inappropriate situations has gotten so bad that bancomicsans.com have amassed a nearly-limitless photo collection. (When) Vincent Connare designed the font for Microsoft in 1995, he decscribed it as best being used for “new computer users and families with children”. Despite this it has been constantly misused and can be seen everywhere from school letters, emails from government officials and even in documents about the discovery of the Higgs Boson. Like the tone of a spoken voice, the characteristics of a typeface convey meaning… Thus when designing a ‘Do Not Enter’ sign, the use of a heavy-stroked, attention commanding font such as Impact is appropriate. Typesetting such a message in Comic Sans would be ludicrous. Though this sort of use if frequent, it is unjustified. This is a contributed post by Printerinks.com. Whichever font you prefer when printing, you can find a wide range of ink cartridges from PrinterInks HP, Brother, Epson, and many other leading brands. This entry was posted on Monday, December 24th, 2012 at 5:26 pm and modified by WebMaster View on Friday, March 21st, 2014 at 5:27 pm. You can follow any responses to this entry through the RSS 2.0 feed. Responses are currently closed, but you can trackback from your own site.